What is Tysons Corner Virginia? The Scan Man selected Tysons Corner, VA as the new home for Modern Image. We decided to move to Tysons Corner because it is the center of the hottest business market in the mid-Atlantic region. If all you know of Tysons is the enormous shopping complex, then read on to learn a little about our new home. 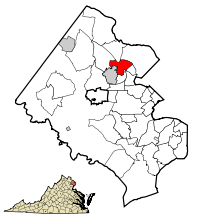 Tysons Corner is an unincorporated census-designated place (CDP) in Fairfax County, Virginia, United States. Part of the Washington Metropolitan Area located in Northern Virginia, Tysons Corner lies between the community of McLean and the town of Vienna along the Capital Beltway (I-495). Companies in the area typically use McLean or Vienna addresses, however in April 2011 the United States Postal Service approved the use of Tysons Corner as a postal address for the 22102 and 22182 ZIP codes of McLean and Vienna, respectively. The population was 19,627 as of the 2010 census. It is the 12th largest employment center in the United States. The area is home to Tysons Corner Center – the largest shopping mall in the state and in the Baltimore-Washington area – and two upscale shopping centers, Tysons Galleria and Fairfax Square, which neighbor it to the north and south. Every weekday, Tysons Corner draws 55,000 shoppers from around the region. Tysons Corner has 46 million square feet (4.3 million m²) of office and retail space, making it an important business district in its own right and the classic example of an edge city. Tysons Corner was one of the inspirations for, and figures prominently in, Joel Garreau‘s pioneering study of the edge city phenomenon. Among the reasons for calling Tysons Corner an edge city is that, in contrast to typical “bedroom” suburbs, people commute into it in the morning and away from it at night, with a daytime population greater than 100,000 and a nighttime population of less than 20,000. That has created a lot of traffic congestion, which local urban planners hope to mitigate by enticing more people to live there, and thus not have to get in their automobiles to get to work if they also can work there. The planned extension of the Washington Metro via the new Silver Line into Tysons Corner will ease access for residents as well. Planners envision up to 200,000 jobs and 100,000 residents in coming decades. Tyson, a Maryland native, was born about 1818. He and his wife Susan (née Harvey) Tyson had nine children: Catherine, Lydia, Rebecca, Frances, Andrew, Anna, Harvey, Bessie, and Susan. As recently as the 1950s, Tysons Corner was a quiet rural intersection flanked by a few small stores. Big changes came in 1963 when the Tysons area moved from a country crossroads to a giant commercial urban area with the awarding of contracts at the interchange of Route 7 and Route 123. The Fairfax County Board of Supervisors in 1962 approved the Tysons Corner Shopping Center, which was planned to be 88.13 acres (356,600 m2) within a 150 acres (0.61 km2) triangle bordered by Chain Bridge Road, Leesburg Pike, and theCapital Beltway. Developers proclaimed it as the largest enclosed mall in the world when it opened July 25, 1968. In recent years, the influx of technology companies into Northern Virginia has brought many new office buildings and hotels to the landscape. The rapid growth of Tysons Corner (in comparison to other locations near the Capital Beltway) has been the topic of numerous studies. One factor was the aggressive promotion of Tysons Corner by Earle Williams, for many years the CEO of the defense contracting firm Braddock Dunn & McDonald. Tysons Corner is located at 38°55′7″N 77°13′47″W (38.918485, -77.229833) at an elevation of 486 feet (148 m). It lies in the Piedmont upland approximately 3.7 miles (6.0 km) south-southwest of the Potomac River. The highest natural point in Fairfax County, at 520 feet (160 m) above sea level, is located in Tysons Corner. Wolftrap Creek, a tributary of nearby Difficult Run, forms the northwestern border of the community. Two of the creek’s tributaries, Moomac Creek and the Old Courthouse Spring Branch, flow north through northwest Tysons Corner. Scott Run, a tributary of the Potomac, flows north through eastern Tysons Corner. Located in Northern Virginia at the intersection of Virginia State Route 123 and State Route 7, Tysons Corner is 11 miles (18 km) west of downtown Washington, D.C. and 6 miles (9.7 km) northeast of Fairfax, the county seat. According to the United States Census Bureau, the community has a total area of 4.9 square miles (12.7 km²), all of it land. As a suburb of Washington, D.C., Tysons Corner is a part of both the Washington Metropolitan Area and the largerBaltimore-Washington Metropolitan Area. It is bordered on all sides by other Washington suburbs, including: McLean to the northeast, Pimmit Hills to the east, Idylwood to the southeast, Dunn Loring to the south, Vienna to the southwest, andWolf Trap to the west. As of the 2010 census, there were 19,627 people, 9,481 households, and 4,754 families residing in the community. The population density was 4,005.5 people per square mile (1,546.5/km²). There were 10,637 housing units at an average density of 2,170.8/sq mi (837.6/km²). The racial makeup of the community was 60.9% White, 27.5% Asian, 4.9% African American, 0.2% Native American, 0.1% Pacific Islander, 1.9% from other races, and 4.5% from two or more races.Hispanics or Latinos of any race were 8.1% of the population. The age distribution of the community was 18.4% under the age of 18, 6.6% from 18 to 24, 40.4% from 25 to 44, 23.5% from 45 to 64, and 11.1% who were 65 years of age or older. The median age was 35.8 years. For every 100 females, there were 91.0 males. For every 100 females age 18 and over, there were 88.0 males age 18 and over. As of 2009, the median income for a household in the community was $103,341, and the median income for a family was $140,115. Males had a median income of $86,312 versus $65,667 for females. The community’s per capita income was $65,024. About 2.7% of families and 3.9% of the population were below the poverty line, including 1.3% of those under age 18 and 12.0% of those age 65 or over. Tysons Corner is Fairfax County’s central business district, with the largest concentration of office space in Northern Virginia. The CDP includes a technology industry base and network infrastructure; around 2007 about 1,200 technology companies were headquartered in Tysons Corner. During that period the technology sector made for about 31.6% of the jobs in the Tysons Corner submarket and 20.2% of the companies in the submarket. Around 2007 Tysons Corner had 25,599,065 square feet (2,378,231.0 m2) of office space, 1,072,874 square feet (99,673.3 m2) of industrial/flex space, 4,054,096 square feet (376,637.8 m2) of retail space, and 2,551,579 square feet (237,049.4 m2) of hotel space. Therefore Tysons Corner has a grand total of 33,278,014 square feet (3,091,628.7 m2) of commercial space. The Fairfax County Economic Development Authority is headquartered in the CDP. The corporate headquarters of Modern Image, Booz Allen Hamilton, Capital One, Freddie Mac, Gannett Company, Hilton Worldwide, MicroStrategy, SAIC, Space Adventures, Spacenet, Sunrise Senior Living, and USA Today are located in Tysons Corner, though most use aMcLean address and occasionally a Vienna address. Firms with offices in Tysons Corner include BAE Systems, Compuware, Ernst & Young, Northrop Grumman, PricewaterhouseCoopers. Xerox, and Vie de France. In 1995, AOL was headquartered in the Tysons Corner CDP, near the town of Vienna. Qatar Airways operated its North American headquarters office in Tysons Corner, although it later moved to Washington, D.C. In 2008, the Fairfax County Board of Supervisors unanimously voted to begin a 40-year plan to urbanize Tysons Corner around the coming four stops of Washington Metro‘s Silver Line to the area, in the vein of neighboring Arlington County‘sRosslyn-Ballston corridor. Tysons Corner serves as a “downtown” of Fairfax County, with one quarter of all office space and one eighth of all retail in the county. It is an auto-orientededge city with severe traffic congestion, and it faces competition from the urban areas of Arlington and newer suburban edge cities such as Dulles. Fairfax County plans to urbanize Tysons Corner by adding multiple modes of transit, pedestrian-friendly street design, and ground-level retail. The decision to build above-ground tracks and stations instead of underground tunnels was controversial, as it went against the desire to make the area more pedestrian-friendly, but planners concluded that the cost of tunnels was too high (the Silver Line will tunnel for only a short stretch under the Route 7- Route 123 intersection). A preliminary estimate from the Fairfax County Department of Transportation suggests that $7.83 billion in transportation infrastructure projects will be needed to help transform Tysons Corner into a high-density urban center from 2010 to 2050, most of which will be allocated to both phases of the Silver Line. The Metrorail Silver Line is expected to be fully opened by 2016. $742 million would be spent on a grid layout. Existing plans call for an intense grid around the coming Silver Line stations. An additional $1 billion would be spent transit and street grid projects from 2030 to 2050. Fairfax County Public Schools operates public schools. Schools within the CDP include Freedom Hill Elementary School, Westbriar Elementary School, and Westgate Elementary School. Fairfax County Public Library operates the Tysons-Pimmit Regional Library in the nearby Pimmit Hills CDP, serving Tysons Corner and Pimmit Hills.